• Did you know that Sophia Stewart owns the original copyrights (1981, 1983 and 1984) for The Third Eye, the manuscript from which The Terminator and The Matrix franchises were produced? • Did you know that Sophia Stewart’s book entitled “ The Third Eye “ was with Fox Studios for five years (1981 –1985)? • Did you know that Fox Studios released Stewart’s work (The Third Eye) in 1984 as The Terminator and it was not until the Federal Bureau of Investigation (FBI) notified her in 2001 that she learned about the theft? • Did you know that in 1986, Sophia Stewart submitted The Third Eye to the Wachoski brothers and they never replied? • Did you know that the 1994-copyrighted script titled The Matrix, owned by the Wachoski brothers, bears no resemblance to the 1999 movie release? • Did you know that this same ’94 copyright was hidden from the State judge during Larry Wachowski divorce proceedings in 2003 and was never entered in the Federal court of Sophia Stewart’s case. • Did you know that in July 2003 in an unrelated case Lawrence Wachoski said that he and his brother wrote The Matrix in 1993 and later on in that same case said it was not true? • Did you know that the FBI investigated Stewart’s case because criminal copyright infringement is a federal crime? • Did you know that the FBI found that The Terminator and The Matrix were based upon Sophia Stewart’s Epic The Third Eye? • Did you know that there have been several revisions to the original Matrix movie released in 1999? • Did you know that direct quotes were taken from Sophia Stewart’s work, The Third Eye? • Did you know that an introduction was taken out of Sophia Stewart’s Epic “ The Third Eye “ and was used in verbatim for the opening of the original Matrix movie? • Did you know that in 1999 Warner Brothers tried to settle the case with Sophia Stewart and negotiations broke down when she was advised not to settle by a studio insider? • Did you know that in 2003, after waiting for the FBI to take action, Sophia Stewart went to court to fight for her rights as copyright owner? • Did you know that the defendants hired the first judge’s son to defend them after the case was filed and that Judge Terry Hatter had to recuse himself from the case? • Did you know that the lawyers representing the defendants admitted “ willful intent “ by claiming that the statue of limitations had run out for the Terminator? • Did you know that Sophia Stewart was represented by four of the most reputable law firms in the country; yet, they have not subpoenaed records & evidence, which are vital to winning her case? • Did you know that Sophia’s case was written in the Law Review September 16, 2004, has received international attention, and is being monitored by lawyers and legal organizations around the country? • Did you know that because of the possible indictments for criminal activities related to this case including copyright infringement, obstruction of justice, collusion, duplicity, and fraud, it is in the best interest of the defendants to settle the civil case to avoid criminal prosecution? • Did you know that The Matrix won four Oscars, one of which was for the special effects which Sophia Stewart created and submitted with her original manuscript? • Did you know that by 2006, The Matrix and The Terminator film franchises have earned over $2.5 billion dollars and to date Sophia Stewart, The Mother of The Matrix, has not received one dime for her work? • Did you know that James Cameron never wrote the Terminator and his name is only part of the title in the ’84 copyright? • Did you know that Gale Ann Hurd’s own Production Company called Pacific Western hired her as an employee to write the Terminator and that Hemdale Film is claiming to be the owner on the copyright? • Did you know while in Federal Court Fox denied distributing the ’84 Terminator yet, they did distribute the film in Germany? • Did you know that the March 31, 1999 nationwide release of the Matrix movie was not registered until April 16, 1999 raising questions on ownership and why a film would be published and released the same day? • Did you know that Warner Brothers’ claim is there is no “ source work “ for the Matrix movie? • Did you that Warner Brothers has stated the Matrix film is based on an original screenplay, and contains an original story? • Did you know that Sophia Stewart has several letters of access from Fox and certified return receipts? • Did you know that Carrie-Ann Moss (Trinity) starred in a 1993 Canadian television series called Matrix? • Did you know that the Wachowski Brothers in an interview with Steve Hockensmith admitted they never wrote the first Matrix film instead they hired comic-book artist to draw the entire movie? • Did you know after Sophia Stewart contacted the Wachowski Brothers they signed a contract with Warner Brothers to never do any interviews on the Matrix movie? • Did you know in a May 13, 2004 letter to Sophia Stewart that Fox admitted to distributing “ Terminator 1 “ in the home video market in foreign territories and claim that they had limited involvement with “ Terminator1 “? • Did you know that the Wachowski brothers had already defaulted by more than 30 days in the federal courts before Warner Brother lawyers decided to defend them? • Did you know that an African American woman named Sophia Stewart created the matrix movie? • Did you know that the same law firm defended all eight of the defendants in the Matrix case? • Did you know that Sophia Stewarts own lawyers prevented her from going to trial because they failed to answer the admissions, failed to put in the evidence and they did not defend the opposition to block Sophia Stewart from speaking? • Did you know that Sophia Stewart got a letter of access dated May 19 1999 from Warner Brothers comparing her original draft of The Third Eye with the Matrix Movie? • Did you know that all of the characters and some of the special effects in the Matrix I film were created by Sophia Stewart? • Did you know that Sophia Stewart has been in the federal court system since April 24, 2003, for over three years? • Did you know that the quote “Ill be back” made world famous by California Governor Arnold Schwarzenegger was created by Sophia Stewart, and is a direct quote from Sophia Stewarts Epic The Third Eye? • Did you know that Sophia Stewart has already made history because her Matrix case is recorded in the courts and has been heard and read about around the entire world? • Did you know why Sophia Stewart was prevented from going to trial and why going to trial would have sent the defendants to jail? • Did you know that the FBI violated Sophia Stewart’s Civil & Constitutional Rights because she did not get due process of the law, and the government failed to protect her copyrights? 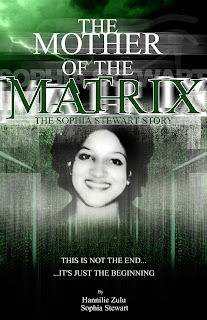 • Did you know that the Oracle in the Matrix movie was based on the real life of Sophia Stewart? • Did you know that Sophia Stewart has been using the Matrix and Terminator for years and no countersuits have ever been filed? • Did you know the defendants have never denied that Sophia Stewart wrote the Matrix or Terminator? ALL EYES ON ME Inc.